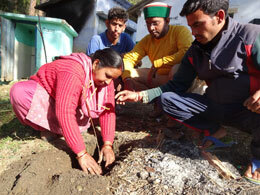 Community going for plantation of traditional plants like Baans (Bamboo), Devdar , Oak. Climate change and human encroachment in the region is making Dodi Tal and Nachiketa Tal wetlands a threat for the community as in the recent past these have resulted in catastrophic floods and landslides in the district. These wetlands are high altitude and also hold a religious importance for the villagers. More than 70 participants comprising of men, women, panchayat representatives, school children and youth learned in-depth about the usefulness of wetlands for environmental protection and income generation as well as the locally adopted measures to conserve them. 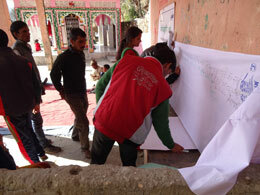 Community people also participated in different activities like painting, slogan writing, speeches, debates and discussions. Saplings of local species like Baans (Bamboo), Devdar, Malt and Oak were planted by the principal and students of Government Primary School, Kuroli. At the end of the event, whole community took pledges, writing them on a white cloth, for conserving the wetlands in their region as well as motivating other people to do the same. 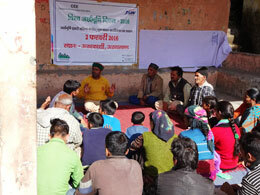 CEE has been working in the State of Uttarakhand for the past 12 years. The focus of CEE's work in the state has been environment education in schools, biodiversity conservation, natural resource management and awareness generation. The Department of Education, State Council of Education Research and Training (SCERT), Uttarakhand Council for Science and Technology (U-COST), Uttarakhand Forest Department, UNESCO and 15 partner NGOs, etc are the agencies with which CEE has been working in the State. Organized educational programmes in schools on conserving biodiversity of Corbett National Park. Organized climate change education programme with schools in collaboration with U-COST. Awareness programmes for students, teachers and communities on local environmental issues and conservation needs through celebrating important days like International Mountain day, National Science day etc. Developed a nature guidebook for teachers, eco-club organizers, park guides and NGOs in Hindi on Corbett National Park. Provided NGO support for the eco development project of State Forest Department by developing village level eco-development microplans for Corbett National Parks, Nanda Devi National Park and Govind Pashu Vihar. Provided support to Forest Department in preparation and implementation of eco-development micro plans for 210 villages in and around Protected Areas in Uttarakhand. Organized one public hearing and 2 paryavaran panchayats. CEE has initiated its CEE Himalaya Initiative in the State along with other Himalayan States. Empowerment of women in twelve villages in Nanda Devi Biosphere Reserve for ‘Conserving plant genetic resources using Alternate Media’. Women in nine villages consulted and organized discussions on genetic wealth in their area held. Communication package for women and media personnel developed. 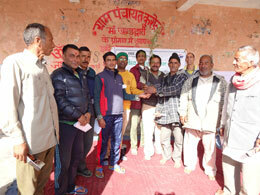 Organized various capacity building programmes with local partner agencies.